Það var ískalt í nótt og við vöknuðum í héluðum tjöldum í morgun. Deginum var svo varið í aðlögunargöngu á fjallið Cerro Bonete sem sagt er vera 5.004 metra hátt en við afsönnuðum það með 3 samhljóða GPS tækjum sem sýndu 5.050 metra. Á leiðinni gengum við framhjá gríðarstórum fjallaskála sem mikið var lagt í á sínum tíma en var lokað fyrir um 3 árum. Hópurinn velti mikið fyrir sér viðskiptatækifærum tengdum skálanum til þess að geta flúið dimmustu vetrarmánuðina á íslandi. Við héldum áfram upp og gengum í gegnum mikinn skóg af snjóstrýtum sem eru algengt fyrirbæri í Andesfjöllunum en finnast ekki víða annars staðar. Á toppnum var frábært útsýni og litadýrðin í landslaginu ótrúleg. 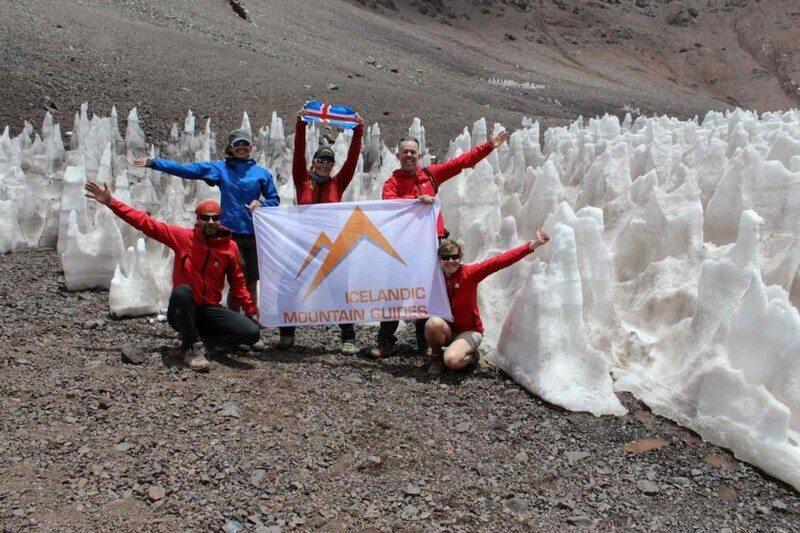 Á meðan við vorum á toppnum i blíðskaparveðri snjóaði í hlíðar Aconcagua. Þegar komið var til baka í grunnbúðir var farið að snjóa töluvert og fyrir kvöldið var snjóföl yfir öllu sem eru viðbrigði frá sólinni og þeim mikla hita sem verið hefur seinustu daga. Á meðan við setjum saman þennan pistil hefur hlaupið galsi í starfsfólk grunnbúðanna og hér geisar snjóboltastyrjöld. Við höldum okkur innandyra og spilum í rólegheitunum meða snjóboltarnir bylja á tjaldinu. Við fórum aftur í læknisskoðun og fengum grænt ljós á frekari hækkun og leggjum ótrauð af stað í fyrramálið. Til þess að minnka byrðarnar tökum við einungis með okkur gervihnattasíma og því munu engar myndir fylgja fréttapistlum þar til við komum aftur í grunnbúðirnar. Last night was freezing and we woke up in frosty tents this morning. We spent the day hiking to Cerro Bonete which is a popular acclimatization hike before climbing Aconcagua. It has been said to be 5004 meters above sea level but we disproved that with three different GPS that all showed 5050 meters. On our way, we walked past a huge mountain cabin that had been in great use back in the days but it was closed down about three years ago. The group did some brainstorming for different business opportunities related to this cabin, and how it could be used in order to escape the darkest winter months in Iceland. 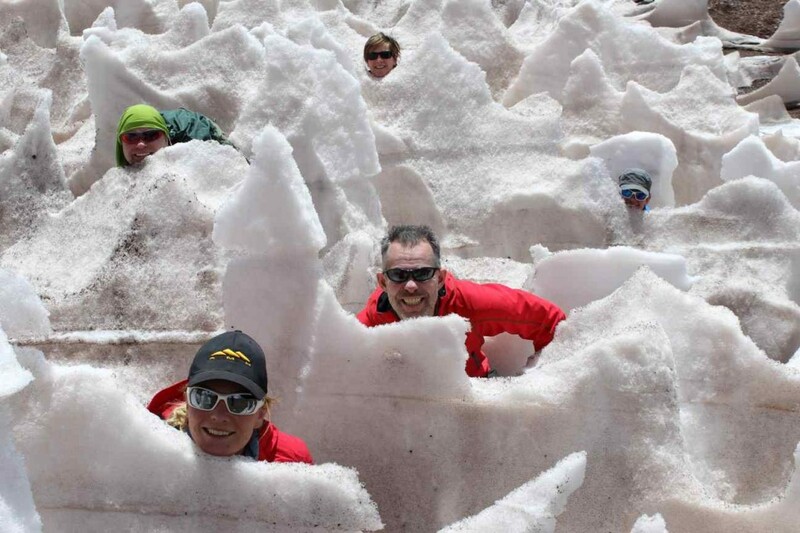 We continued up and walked through a great forest of spikes of snow or ice (see pictures) that are mostly only seen in the Andes Mountains. From the summit, the view was spectacular and the various color changes in the landscape were incredible. 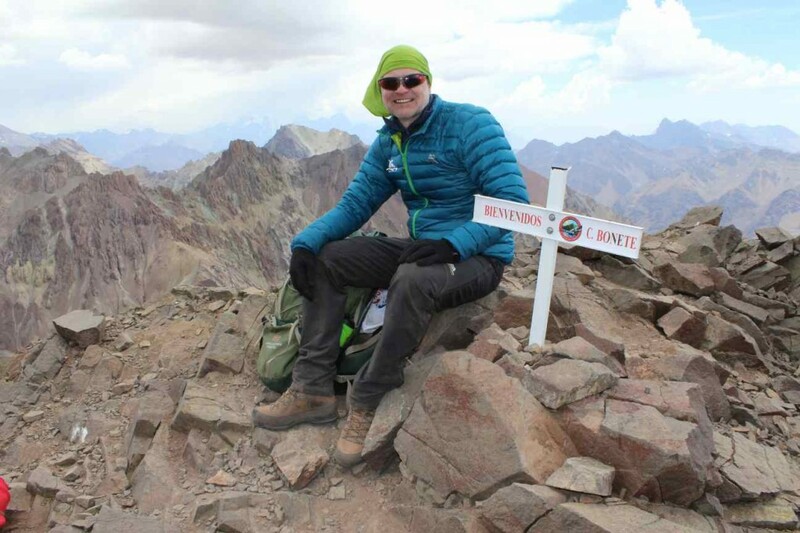 While we were at the summit in this perfect weather, it had started snowing and the slopes of Aconcagua were almost covered in snow. When we got back to base camp, it had been snowing quite a bit so the ground was fully covered with fresh snow. A little different from the enormous heat and warm weather these last few days. We had another medical checkup and got a green light to further continue with our gradual acclimatization to altitude, starting tomorrow morning. 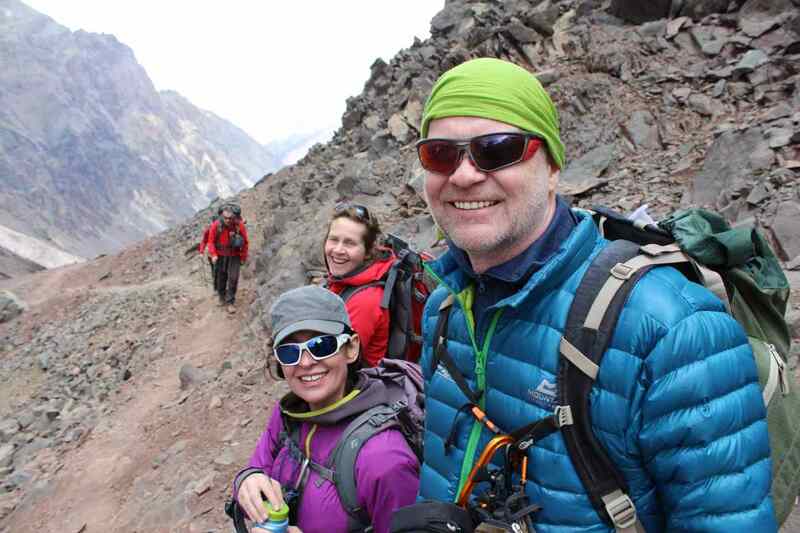 To keep the weight of our gear down, we are only taking the satellite phone with us and therefore there will be now pictures in the next few blogs until we are back at base camp.